Along with many other countries, the UK is seeking to increase the proportion of energy that is obtained from “renewable” sources, such as those that exploit wind, biomass or solar energy. One of the most popular of these, particularly in the domestic market, involves producing electricity from solar energy using photovoltaic (PV) panels. The uptake of these systems has been encouraged by government incentives and the number in use has grown rapidly in recent years. All new technologies can introduce new risks, and new energy-handling systems can introduce new fire risks. Evidence is emerging of the potential for fire hazards associated, directly or indirectly, with renewable energy power generating systems such as PV and wind turbines. Fires involving these systems can present challenges for the fire service, building occupiers and insurers. 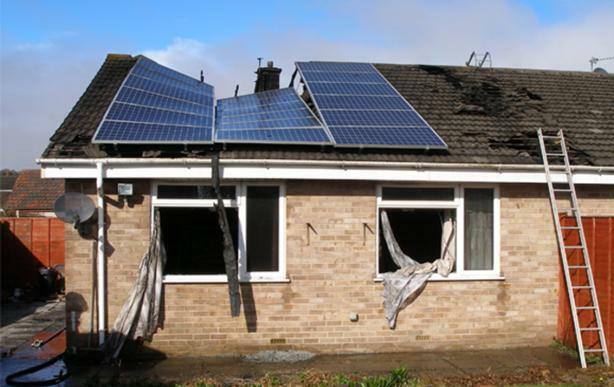 While such fires are not common, incidents involving PV systems are being reported – in the last two years BRE has been notified of eight incidents which were of concern. Some potential fire safety issues involving PV systems are highlighted below. This information has been taken from a longer article published in International Fire Professional, The Journal of the Institution of Fire Engineers, October 2013 Issue No.6. That article set out to raise awareness of the emerging issues and, without causing undue concern, provide information to help avoid, minimise or manage fire incidents. There is no reason to believe at present that the fire risks associated with PVs are any greater than those with other electrical equipment. But as these systems are now more common, it is important that any risks associated with them are more widely appreciated. PV panels generate electrical power by converting solar radiation into direct current (DC) electricity, using the photovoltaic effect in specialist semiconductor materials. They should be installed in accordance with national guidance and any specific guidance issued by manufacturers. Building fires known to BRE where the PV systems have been the cause of the fire have generally resulted from poor installation, or the use of wrongly specified, incorrect or faulty equipment. For example, there have been reports of AC isolator switches being used mistakenly in DC circuits, resulting in a build-up of heat in the switch enclosure and leading to a fire. In addition, poorly installed panels may obstruct or restrict the use of roof windows as means of escape. In the event of a failure of the AC supply to a building (for example due to a local power cut or a fire), the inverters are designed to shut down automatically. However, the solar DC supply – from panels to the DC isolator – will still be live during daylight. It may therefore be necessary to manually isolate the DC cables and components from the PV panels which will otherwise remain live. If a fire damages the DC cables from the PV array, for example by burning off insulation, there will be risk of electric shock from the exposed DC conductors, particularly for fire-fighters. They are not accustomed to dealing with DC in buildings, and potentially face very high DC voltages (up to 1000 volts in large installations). A particular risk to fire-fighters has been identified overseas, but not verified with evidence. This involves the potential risk of electric shock from current being conducted down a fire-fighting water jet, or from fire-fighters cutting through PV panels as part of their strategy to vent the fire. Other overseas reports include the strategy of USA fire-fighters when dealing with the parts of the system that may always be live while light falls on the panels. They use portable covers for the PV panels in order to shut off the light supply and prevent electricity generation. 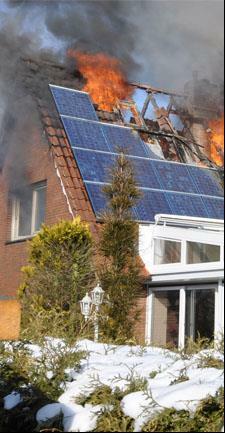 If the roof of a building is affected by fire, the additional mechanical loading due to the weight of PV panels may cause early collapse of the roof (see right). At present there is no reason to believe that the fire risks associated with PVs are greater than those associated with any other electrical equipment. But as with many new technologies, PV systems can introduce some new risks. It is important, therefore, for fire and rescue services to formulate appropriate and sound operational guidance for dealing with fires involving PV systems. It is also extremely important that these systems are correctly designed, consist of properly tested components, and are competently installed and regularly maintained. The UK government supported Microgeneration Certification Scheme (MCS), is a quality assurance scheme for small-scale renewable energy generation products and installers – including those for PV systems. They are assessed by Certification Bodies such as BRE Global. BRE Global is a UKAS accredited Certification Body, No. 0007. The full version of this article can be viewed here.